Phasers set to stun? This one certainly is! The Moonphaser is expensive but next to collectable vintage phasers it justifies its hefty price tag... just. Vintage vibe. Simple operation. 'That' tone. Boutique price tag. Not best suited to extreme high gain sounds. 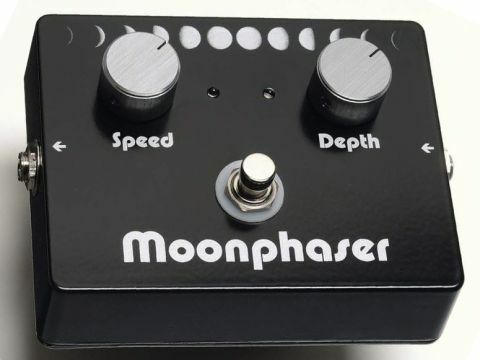 This Moonphaser pedal draws its inspiration and tonal qualities from the magical phaser designs of the seventies like the Mu-Tron and arguably one of the most sought after, the Maestro MP1. The Moonphaser is dripping with authentic seventies character, although it's housed in a smaller more pedalboard-friendly enclosure. The very best NOS (new old stock) components have been paired with modern top-quality capacitors and low-noise metal film resistors. This means that the problems of old, like inconsistent quality and tone, should be consigned to history. We get two simple controls: speed controls the modulation rate between one phase cycle every eight seconds right up to six cycles per second, and depth. The effect is switched in and out by a true-bypass 3PDT footswitch and housed in a lovely Hammond enclosure with retro moon-phase graphics, blue LEDs and brushed aluminium knobs. Sweet and chewy is the order of the day. With the speed and depth at two o'clock it's perfect for those big clean-funk grooves of the 1970s. The Moonphaser's amazing high-end clarity supplies lashings of lush, liquid phase. Even with the depth control maxed out your guitar tone will retain all of its character and sparkle. Stick a great smooth-sounding overdrive pedal in the mix and you will experience incredibly sweet gain phasing. Careful though, the Moonphaser won't hide any top-end shrillness. If you're looking for that vintage, funk/rock phase-sound there is simply nothing else on the market that matches up.